Though nearly eight years have passed since its introduction, Bitcoin is still shrouded in a bit of general mystery. Let’s look at the top 5 myths related to this popular cryptocurrency. Bitcoin is a bit of a buzzword these days – it is to cryptocurrencies what Kleenex is to facial tissues. It has become the face of the crypto-cash world and is the subject of thousands of articles either espousing the excitingly-lucrative nature and high potential of the currency, or denouncing it as a dangerous investment vehicle that has a short and unstable lifespan. You’ve probably read a handful of articles written by both camps, but the number of myths circulating out there about Bitcoin seems to increase every day. Let’s take a look at the top 5 myths about Bitcoin to help you decide which side of the fence you’re on. Myth #1 – Bitcoin is falling out of style: Nope. Not even close. According to Bitcoinity.org, the overall volume of Bitcoin has increased dramatically over the past five years, from a low of about $154 million per day in late 2013, to a recent high of more than $11 billion in September of 2017. 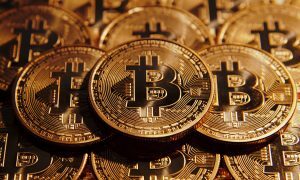 In addition, the price has steadily appreciated from $118 per Bitcoin to more than $10,000 each. Bitcoin is the most popular cryptocurrency available today, and price and volume charts show aggressive valuation and trading volume momentum. Myth #2 – Bitcoin has no value: Bitcoin isn’t backed up by something tangible, like gold or silver, so it will never quite have the same level of security you’d find with a commodity like gold. But, Bitcoin certainly has value. It has value because individuals can use Bitcoins to trade or purchase other currencies or even buy things in a retail setting and it is backed by the confidence of those who deal in it. Think about the value of the US dollar. The 75% cotton/25% linen blend in a dollar bill isn’t really worth anything, but the fact that the world has general confidence in the US economy creates value in the currency. Bitcoin operates in a similar manner – it has value because it can be used confidently. Myth #3 – Bitcoin is anonymous: Anything that is completely anonymous and involves investing your personal money should probably prompt you to run for the hills, but Bitcoin isn’t as anonymous as you might think. Some people have mistakenly branded Bitcoin as the “currency of the dark web,” but this is simply hysterics at play. Yes, your trading account that you use within the cryptocurrency network doesn’t divulge your personal information to others (that’s a good thing, right? ), and you can essentially operate via pseudonym at all times, but every transaction within the Bitcoin world is recorded and maintained on a public ledger. Myth #4 – Bitcoin is for criminals: Sounds a bit dramatic? Unfortunately, Bitcoin has earned a quite misguided reputation as a currency best reserved for those engaging in terrorist or illicit activities. Websites like Silk Road have been linked to Bitcoin transactions, but the true number of illegal activities specifically tied to Bitcoin is quite low. Bad guys tend to use a variety of payment forms when engaging in illegal behavior, but recent legislation has made Bitcoin a poor choice for criminals. Additional checks and balances and verification protocols make Bitcoin better suited to adrenaline-seeking investors versus garden-variety bad guys. Myth #5 – You can’t buy things with Bitcoin: No, you can’t easily buy a loaf of bread these days with Bitcoin, but remember back in the olden days (ok, it wasn’t really that long ago) when you had two choices when it came to paying for your groceries, check or cash? We’ve come a long way from those days, and today’s smart retailers are recognizing that something as simple as Apple Pay or other virtual means of transacting helps speed up and simplify the process of buying goods and services. It is just a matter of time until Bitcoin or other cryptocurrencies become commonplace. Four years ago Forbes published an article called “Living on Bitcoin for a Week.” It’s possible, and probable, that Bitcoin will be a big player soon. Bitcoin is an interesting investment choice. No, it should not represent a large share of your current portfolio, but if you’re willing to dabble in something that is volatile and new, you might give it a try! Just remember to allocate the rest of your investable assets to stable, proven vehicles like precious metals. If you’re ready to rebalance your portfolio with gold, silver, platinum or other precious metals, contact American Bullion today!